I've been interested in shooting with a pinhole camera for a while. So I decided to create one... 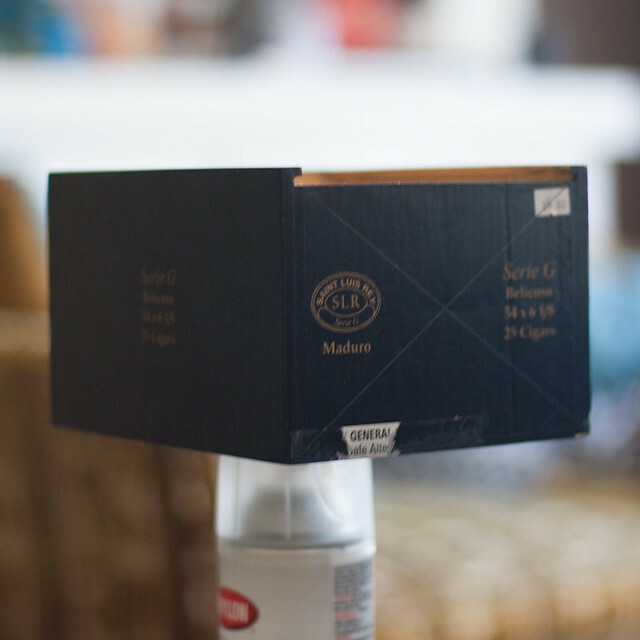 I was inspired by other people who've used cigar boxes as a base for their pinhole cameras. I've mulled around with how cool it would be to create my own, even possibly having a detachable back for 4x5 exposures or even having interchangeable lenses. I came to a point in dreaming about this to actually making it. A few weeks ago, I started looking for a box. I walked into a cigar shop hoping to find a box that would fit my loose specifications, should look pretty light proof and sturdy. I found this San Luis Rey Cigar Box which happens to be abbreviated into SLR on the lid. The lid itself is a sliding lid which gave me the impression that its pretty light proof. After I bought the box, I shared the idea with my friends. I was already excited for this project because all the rest of the work that needed to be done was just putting in a hole, light proofing the box, and getting some light sensitive paper. It was a simple idea, but that idea somewhat evolved. 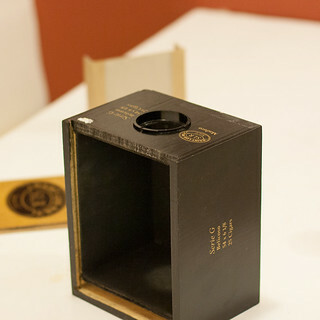 I thought to myself, while I make a pinhole camera, I could also use the same pinhole for another one of my cameras. Then I thought, well, why don't I mount it to the box? First things first, safety first; if you're a child, please seek some assistance from an adult. When sanding and sawing, wear some goggles and a face mask to prevent inhaling dust. Be careful with the Exacto Knife as its very sharp. Okay, first thing I did was measure the box and mark the center. The following picture shows the box marked diagonally to find the center. 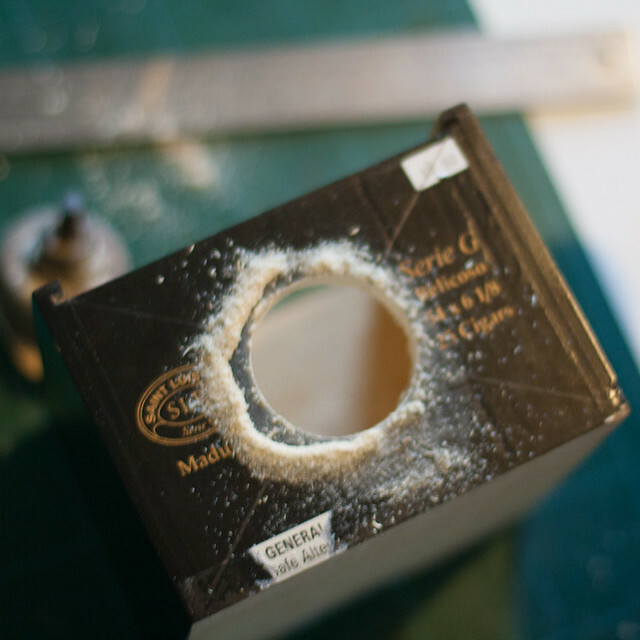 Once its marked, punch the center with a nail enough to create an indent in the box. This helps the drill to remain in the center of the box. Sand off the area that was drilled. Superglue the lens back cover to the drilled area; make sure to not push the lens back cover too far that you can't replace the the body cover. 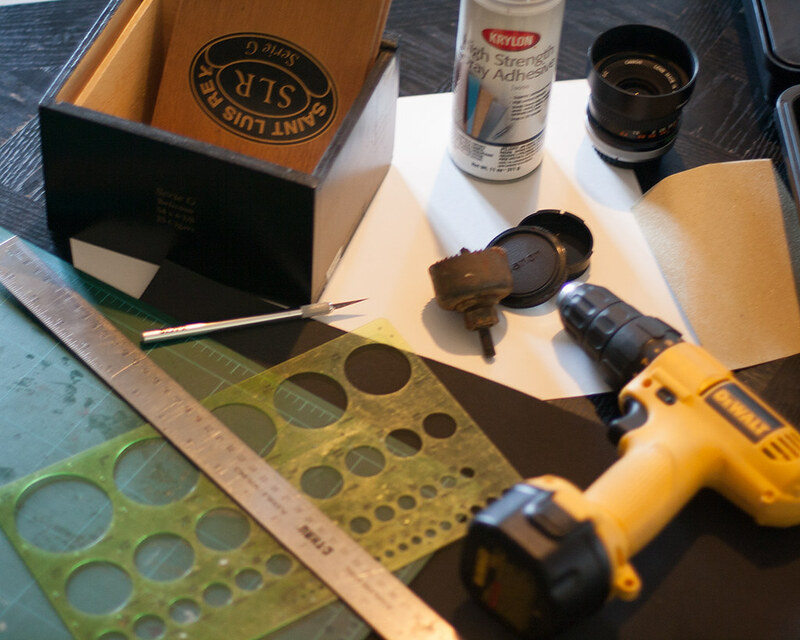 With those measurements, mark the black foam to be cut for the interior of the box. You may need to adjust some measurements for the thickness of the foam. Just realized, this post too long... don't read. Use a piece of black tape to cover the hole and use it as a shutter, when mounting an SLR lens to it, use the lens cover as a shutter. You might want to measure the focal length required for your lens before using it. I created a removable back for my lens. 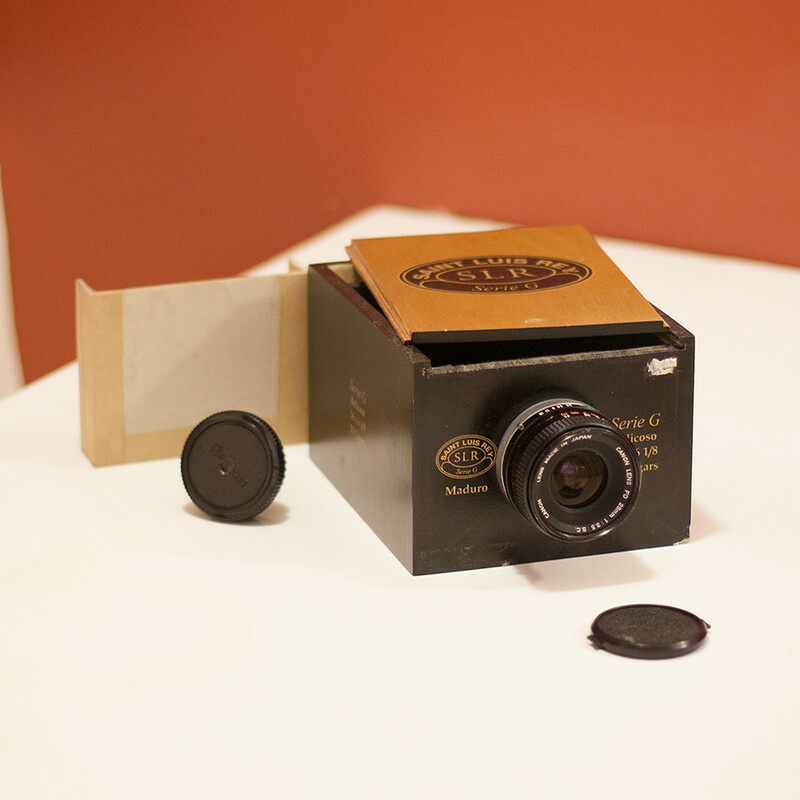 Now the next part of this project is to get some photo sensitive paper 4in by 5in, or make some cyanotypes using this cigar box camera. You should have put the "don't read" instruction up at the top of the post. You know, I spent so much time actually building the box, then documenting everything I was doing that I only realized then that this might not be worth reading. But then I though well, someone out in the internet might get some ideas from this so I'll just leave it as is.